Make your NIE website the gateway to your digital replica edition! 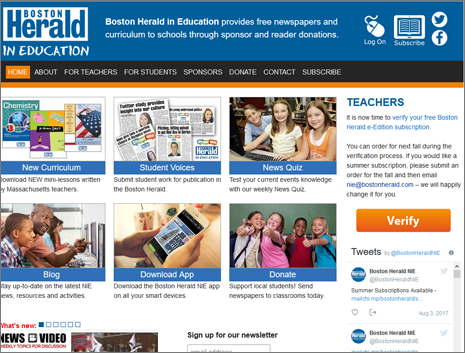 NIEonline works with newspapers in support of their independent Newspaper In Education program. Our online classroom resources and other innovative materials provide new ways for teachers to use your newspaper as a “living textbook” in their classrooms while helping to build repeat traffic to your digital replica edition. Using your branding and classroom resources tied to current events, our NIE websites engage students with interactive quizzes, video and audio in easy to access, user-friendly formats right from your website. Let us host, manage and update your NIE website so your overworked in-house tech staff doesn’t have to. Program updates you initiate are completed, in most cases, within hours and definitely within 24-hours unless otherwise agreed upon. Professional journalists use solid news judgment to tailor our lessons to the most important events of the week, which enhance the relevance of your daily newspaper as a “living textbook” in the classroom. Tired of manually entering orders? 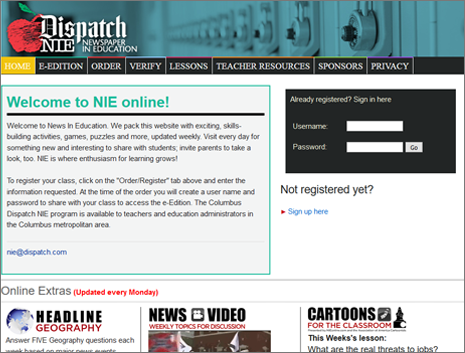 Let teachers place orders directly from your NIE website with our custom online ordering software. A password-protected administration area provides access to your data so you can download real-time reports and manage users as needed. No more chasing affidavits! Easily email a verification reminder to every active order within a specified subscription period. Add an additional level of encouragement by allowing the software to block email addresses with unverified orders from re-ordering until the past order is verified. We provide digital edition login and user validation procedures with immediate access upon order submission. Or, we can integrate our online ordering system to work with your current authentication process. Visit these NIE websites designed and managed by NIEonline. Feel free to contact them. Ask how we work with them. It’s how we’d work for you!